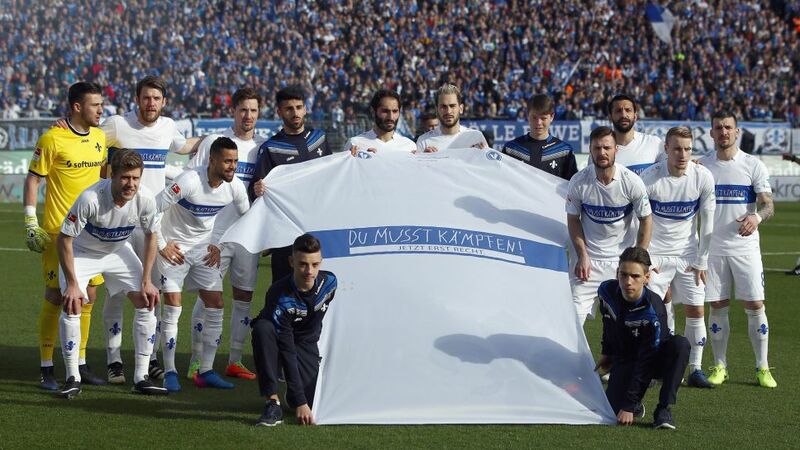 Darmstadt captain Aytac Sulu says the spirit of Jonathan Heimes inspired the team to victory over Mainz on Matchday 24, as the club and its supporters once again paid tribute to the lifelong Lilies fan who lost his battle with cancer a year ago. A special atmosphere had taken hold of Darmstadt in the week leading up to Saturday's game at home to Mainz. To commemorate the one-year anniversary of the passing of lifelong fan Jonathan 'Johnny' Heimes – who died on 8 March 2016 after a long battle with cancer – the club announced that it would be producing a special one-off strip that the players would wear against the 05ers. In a nod to the year the club was founded, club president Rüdiger Fritsch said that 1,898 shirts would be put on sale to the general public, with proceeds going to Du Musst Kämpfen! ("You Must Fight! "), the charity foundation set up by Heimes to help fellow cancer sufferers. All 1,898 sold out in a single day. Before kick-off on Saturday, the Darmstadt fans unveiled a huge version of the shirt in the stands of the Jonathan-Heimes-Stadion-am-Böllenfalltor, the stadium which was renamed in Johnny's honour last September. Bearing the motto, "You Must Fight! ", it seems to have struck a chord with the Darmstadt players, who came into the weekend bottom of the table, and 11 points from safety. Playing with greater passion and determination than they had done for several weeks, The Lilies claimed a 2-1 win over Mainz, bringing an end to a three-game losing streak. Sulu, who laid the foundations for the victory with a fifth-minute opener, explained that Johnny's bravery in the face of illness had acted as a driving force. "The spirit of Johnny inspired us," he declared. It was a fitting moment on a special day for the Lilies, who doubled their lead through a Sidney Sam penalty on 12 minutes. Robin Quaison pulled one back for the visitors, but Darmstadt – in spite of having Mario Vrancic sent off on the hour mark – held on for all three points. Somewhat frustratingly for coach Torsten Frings, they remain 11 points adrift at the bottom due to results elsewhere. "The table still looks really bad," he admitted. "But it is a good feeling to finally win a game." His opposite number, Martin Schmidt, also praised Darmstadt's performance – saying that his Mainz players ought to have followed their example. "The Darmstadt players showed aggression and desire from the very first minute of the game. We didn't." Jonathan Heimes celebrated with the Darmstadt players when they secured their long-awaited return to the Bundesliga in 2015, wearing bracelets with the "You Must Fight!" motto. A talented tennis player in his youth, Heimes had set up the charity earlier that year with professional player Andrea Petkovic, whose father used to coach him. The story between Heimes and Darmstadt is a special one indeed, and the memory of his extraordinary resistance – being diagnosed with cancer at 14, and fighting on until 26 – will only continue to inspire The Lilies as they battle to stay in the Bundesliga. One thing's for sure: nobody would have been happier with Saturday's victory over Mainz than Johnny himself.